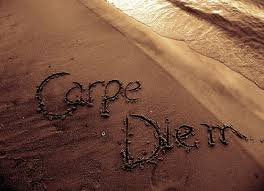 Carpe Diem: Seize The Moment, Seize The Day! Sometimes we never take time to seize the moments that are precious in life, instead we find ourselves rushing through life from one moment to the next moment. Every moment becomes a speck in our mind leaving empty voids of us rushing through life. We begin to rush our life where living in a microwave generation is the norm. No one has patience to take the time to breathe and look into the sky to see the clouds depart as if heaven was reaching out to them. Every sunset and sunrise becomes a blur that seeps into the back of our minds. Every day should be cherished and seized with living in the moment. I realize life can be consuming if we allow it to consume us, however we have to be willing to step away from the outside world long enough to silence ourselves. I believe silence is the most profound thing we can cherish to recollect our thoughts. When you begin to seize the day you allow yourself to get caught up in the journey not the destination. Life is made up of many journeys with many lessons, nevertheless we have to be able to step away from the chaos long enough to embrace seizing the day. According to Webster’s Dictionary carpe diem is best define as the enjoyment of the pleasures without concern for the future. So often, we become stressed with life that we never indulge in the simplicity life offers. Enjoying the simple things such as birds chirping in the early am, watching the stars at night or looking at the brightness of the sun have lessons and pleasures attached to them. If we become prone to seizing the moments we will be happier and less stress. Stress is gained when we are filled with the worries of the past. Carpe diem is much more than a common expression but it is the way to live life. I challenge you to take time to slow your pace, embrace nature and meditate in the stillness. Life is sweeter when we throw off the blues to allow joy to radiate our souls. Life is waiting for you patiently to seize the day with pleasure! Giving Back To Yourself During The Holiday Season!